Here is a MIDI version using the Sibelius software together with NotePerformer plugin. Montreal, July 19, 2017 – On August 10, the composer Louis Babin will conduct his new symphonic piece Mutations in the magnificent 12th century church of Saint-Gervais, in the Southwest French city of Jonzac. His work will be performed by an international orchestra made up of young musicians participating in the Eurochestries Festival of Charente-Maritime during the closing concert. A second performance of Mutations will also be part of the closing program in the city of Pons on August 11. From August 1 to 12, the festival will showcase youth orchestras from China, Spain, Estonia, the United States, France, Italy, Serbia, and Russia. Louis Babin’s new symphonic work brings to life the dramatic environmental mutations shaking and reshaping the planet. It is part of a suite in conjunction with pieces from composers Liang Hongqi from China, Juan Cruz Guevara from Spain, Jüri-Ruut Kangur from Estonia, and Jean-Philippe Vanbeselaere from France. All their works are inspired by this year’s theme, “Environment and Music in Common” and could later be performed individually or one after the other as a single piece. It is both an illustration of our current lives and an ode to hope for future generations as they build their future. Louis Babin will also conduct the creation of composer Liang Hongqi’s piece. It is Louis Babin’s second commission from the International Federation of the Eurochestries, the first being Saint-Exupéry: of Heart, Sand, and Stars. This year, the Federation organizes festivals in Brazil, China, France, and Russia, bringing together hundreds of young musicians from across the globe, separated by languages, but united in the universal language of music. During its festivals, the International Federation of the Eurochestries brings together youth orchestras from all around the world. 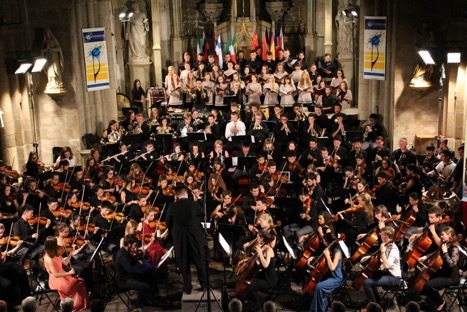 Its mission is to promote orchestral practice of the young people aged between 15 and 25, through international exchange. The Festival offers to each guest orchestra the opportunity to showcase talented composers and repertoire from their country to a wide audience. Participating orchestras perform their own program, but also work with musicians from other nations to prepare the closing concert. This originality has made Eurochestries festivals a hub for moments of human and musical exchanges. The final concert, during which all of the musicians come together, is the ultimate goal of the festival. Louis Babin’s work has been acclaimed in Canada and abroad. His 2015 album features his symphonic piece Saint-Exupéry : de cœur, de sable et d’étoiles (Saint-Exupéry: of Heart, Sand, and Stars) , an hommage to Antoine de Saint-Exupéry, the publication of which was supported by the Antoine de Saint-Exupéry Youth Foundation. The album received outstanding reviews. Many music ensembles and performers from Canada, the United States, and Europe have commissioned or performed Louis Babin’s works. He is known for his modern, playful, accessible, and cinematographic works. He received a special mention from the World Music Competition IBLA Grand Prize (Italy) and was a finalist in the Canadian Music Centre Composer Competition – Quebecor. Information : Sylvie Castonguay +1 514 713-8302.